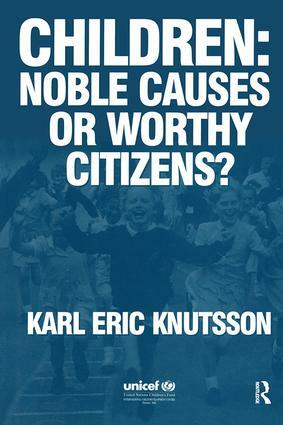 Children: Noble Causes or Worthy Citizens? Since the International Year of the Child in 1979, advocacy for children has intensified. The Convention on the Rights of the Child has propelled this advocacy decisively into the midst of the political debate over human rights. Attempts to construct and support the theoretical and empirical underpinnings for a fresh approach to children and childhood are also intensifying. Nonetheless, policies targeted at children continue to suffer from pervasive theoretical weaknesses. This is persistently constraining appropriate action. This book argues that for both theoretical and practical reasons children need to be understood in their own right. It asks fundamental questions about the perceptions we have of children and childhood and about the ways these perceptions emerge to influence and shape our assumptions, preferences and choices concerning children. It tries to deepen understanding and interest by clarifying the theoretical, ethical and pragmatic reasons for transforming the political neglect of children into recognition and action. The book is divided into two parts. The first part examines cultural and social variations in perceptions concerning children and the second part draws conclusions from the analysis. It concludes by proposing practical lessons which may be learned from the debate about children. Contents: The Nature and the Location of the Debate: The many environments of the child; Different times, different children; Commonalities and variations in perceptions about children; The nature and the location of the debate; The debate in practice: the case of UNICEF; Learning From the Debate: the Need for Change: Tools for a better understanding; The need to rethink development; Recognizing the citizen child; Bibliography.